Yep, Vanilla comes from Mexico! Many people think that the vanilla bean originally came from Madagascar, but even though vanilla beans are grown there, they originated and were first cultivated in the lush state of Veracruz, which physically hugs the Gulf of Mexico. In fact, vanilla grown outside of Mexico has to be pollinated by hand, since the only insect that will pollinate it is the stingless Melipona bee, which only lives, and can only survive, in Mexico. Vanilla, the fruit of the world’s only orchid with an edible pod, has been used since pre-Hispanic times by the Totonacs, first, then by other indigenous tribes throughout Mexico. The Totonacs were so incredibly resourceful they were able to develop the growing, harvesting and curing and drying methods that make vanilla edible. It was so revered it was used for sacred rituals, as well as for currency. And it is in Totonac lands, mainly in Papantla, where the finest vanilla thrives today. Not only does vanilla have a matchless flavor and one of the most sensual fragrances, it also has a deeply romantic tone — just like the legend behind it. Here’s how it goes. According to Totonac mythology, the flower was born when Princess Xanath, in charge of caring for the Temple of the Goddess of Harvest along with eleven maidens, fell in love with Zkatan-Oxga. A doomed romance from the start, as Xanath’s father would never accept him as a son in law. They eloped and were captured and killed without having the chance to even kiss. In the place they were killed, were their blood spilled, a climbing vanilla orchid grew in an eternal embrace, as only true lovers would. Legend or not, the very delicate vanilla plant is actually a temperamental species of orchid that has to be treated like a capricious bride to be in order for it to bloom, be pollinated, harvested, and cured and dried in such a way that either vanilla beans or vanilla extract can exist. The flowers open up for one day only. One single day. After the flowers open, there are only 12 hours in which they have to be hand pollinated, if not pollinated by the Melipona bee. Then the pods take six months until they are ready to be harvested by hand, while still green, so they won’t dry out, crack open, or touch the ground and therefore lose the essential oils that give vanilla its unique flavor and aroma. During all those months, the caretakers have to make sure there is enough shade, enough air, just enough of everything, really. 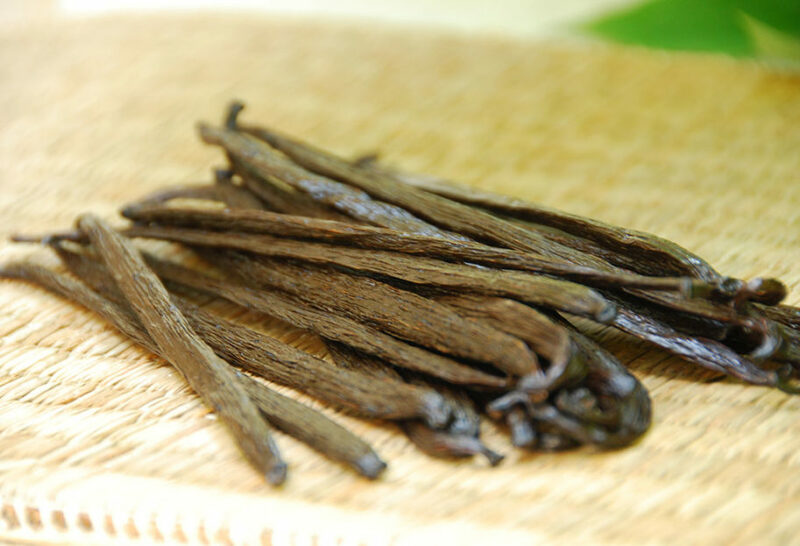 Once hand picked, the vanilla beans are put in hot water or in a hot oven to stop them from maturing further. After that, they bask in the sun during the day and are placed in drawers at night to sweat. The process is repeated every day for 20 to 28 days. It is known in Mexico as “beneficio,” a process for which the world has to be grateful: for the earthy, almost other-worldly smell that makes me practically swoon and the flavor that makes any ingredient sing. It even makes men fly! It is said that it is because of vanilla that the Voladores or Papantla fly. According to myth, over 400 years ago the gods stopped the rains because the people weren’t paying enough attention to them. The acrobatic dance ceremony was created to appease the gods and bring back the rains, so the vanilla beans could grow and thrive. The Voladores de Papantla continue to dance, and vanilla in Mexico continues to thrive. The best part is that wherever you may live in the world, you can get your hands on vanilla grown, harvested and cured in Papantla. Once you smell it and use it, you will be as I am, bewitched. Where can I buy the vanilla from Veracruz? Give your local Mexican/Latin/International market a try, or try online, Gloria. I buy Molina Vanilla-Mexican Vanilla 250ml (2 Bottles) from Amazon for $10.58. I like it because it has a richer taste than some other vanillas, without the strong alcohol taste or smell. For the price it’s well worth it. Mexican Vanilla is the best . My friend brought me some she purshesed in San Miguel de Allende . I store it in my fridge and use it gingerly . Oh what a great gift, Laura! I loved your info on vanilla. We visited Panpantla to see the place where it started. It was vanilla paradise, the volodores were fantastic and of course we bought beans and bottles. Did not know about the pollination aspect. I wished some one could bring the humble Mexican vanilla bean back to world status it originally once had. I’m so happy to hear you enjoyed Panpantla, Carlota. Thank you so much, Pati. I am writing a community cookbook as a fund-raiser for a small women’s group I belong to. (We use our profits for student scholarships in Mazatlán, Sinaloa, where we live.) I want to include your information about vanilla! I probably won’t have space for the whole article, but will paraphrase it and give you credit, if that’s OK.
I’m (maybe) calling the book Mazatlan’s Melting Pot/El Crisol de Mazatlán, with bi-lingual recipes from my expat friends and our Mexican neighbors. Fun for an old retired gringa! I don’t have access to your PBS shows except on YouTube, but look forward to your monthly email. Of course! All long as you give credit all is good, Diane. Good luck with the project. So, this has been a really interesting read! I’m headed to Amazon to look for a bottle of this magical mystical liquid of the gods. Thank you for the informative story. Looking forward to finding and trying, real Mexican Vanilla. Enjoy your show on Saturdays, and how sweet to see how JuJu has grown up. I’m so glad you enjoyed the post, Dionisia! I hope you enjoy tomorrow’s episode. I loved the story behind the vanilla beans. I will be purchasing some Mexican vanilla beans and extract. I love your show, Pati. I’m setting a reminder for your Food Network appearance. What a beautiful story! My grandmother introduced me to Mexican Vanilla when I was a little girl. When she baked with it, the house was filled with a delightful aroma. (I still have one of her old bottles that I just can’t throw out!) For over 42 years, I, too have used Mexican Vanilla in my baking. If I can’t use Mexican Vanilla, I don’t bake! Besides, it gives us a reason for our Mexican vacations! Thank you for the beautiful legend/story and allowing me to relive a memory of my grandmother who is no longer with us and I miss every day! Gracious! PS Love your show and you! We have enjoyed watching your handsome boys grow up! Thank you for sharing your beautiful story, Connie! I hope the show brings back many more wonderful memories. Yo no tenía la menor idea como es que se cultiva la vainilla. Con razón cuesta lo que cuesta, pero sin vainilla no tendríamos ese sabor que enriquece los postres y pasteles que les encanta a mi familia… y ¡también a mí! Tengo nuevo respeto y apreciación por la vainilla y por ellos quien laboran para cultivarla. Un montón de gracias por darnos la historia de la vainilla. Por medio de usted yo aprendo mucho y se lo agradezco con todo corazón. ¡Saludos! I lived in Mexico for many years, in Tamaulipas, near SLP. I was always under the impression that the Mexican vanilla in my local stores was either imitation or watered down or something, because it was so cheap. I don’t remember the price, but it was a huge bottle for, say, thirty pesos? I always bought a little bottle of McCormick’s vanilla, which I would get at a chain called Grande, for over 100 pesos. Oh interesting, Loraine. Vanilla prices can change depending on where you are. Thank you for sharing this lovely story. Your writing has the magical quality that I find that gifts your TV broadcast so very enjoyable! Aww thank you so much Anna! I love the story beautiful. I’ve been a follower of your blog and your TV show for a long time, and I love all your recipes and all your adventures during the trips. I was very surprised after I read this post because I did not know that vanilla was originally cultivated in Mexico. For this reason, my whole life I’ve been purchasing vanilla either from Madagascar or Indonesia, and the results were always pretty acceptable. However, after reading this post I really wanted to try Mexican vanilla. For almost a year, I’ve been purchasing Mexican vanilla beans from different sources and the results are amazing. I’ve made vanilla extract and vanilla sugar, and I am completely fascinated with the results. My house smells wonderful and my desserts taste way better than when I was using vanilla from different places. So, if you have never tried Mexican vanilla beans, give them a try. They are just amazing. Pati, I keep trying to google and google vanilla from papantla to buy, but am having ZERO luck. I’m sure you don’t want to promote one brand or company, but any other tips? Even looking at various stores here in northern california…I have come up with nada. Help! Yes,Vanilla comes from Mexico……many people don’t know……I’m glad you published this information.Thanks Pati. I love Vanilla. Ive been making my own extract and sugar with fresh plump beans for several yrs. I’m interested in making syrup,?? And I’ve also made paste for baking. Do you have favorite recipes for those? And oil also hadn’t occurred to me. What are your uses for the oil Patti. Love your site! And ideas , Lori. I use the vanilla oil for so many things. In salads, over roasted potatoes, in pasta! Where can I buy vanilla extract from Papantla? Thank you. You can find it in some stores but also online! Browse and you will find it for sure. Love the history lesson, I really dig any history whether factual or mythical of the Mexican and central American people, keep these emails coming. So glad you liked the newsletter, Jesus!